A post-harvest line next to the field. The client asked us for a facility for potatoes, onions and carrots. The client asked us for a facility for potatoes and carrots. 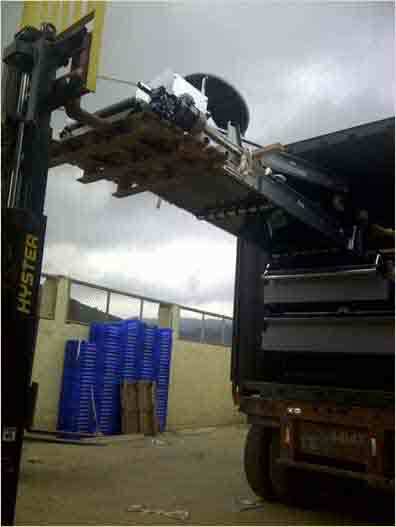 Packed into 50-pound sacks, with the option in the future of also packing them into sacks of 2 kg or more. Packed into 50 pound sacks, with the option in the future of also packing them into sacks of 2 kg or more. All with an input capacity of up to 25 tonnes. Why do we emphasise that they needed 25 tonnes of input capacity? Because when you grade produce into four sizes, each size generates a different flow of produce. 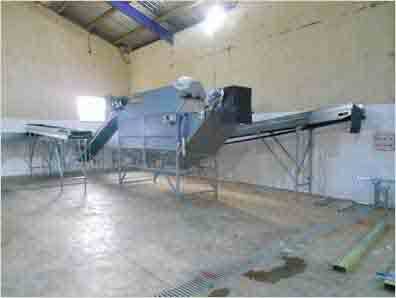 However, a weigher and packing machine can only weigh and pack one size at a time. So you must choose between installing four production lines after the grading machine, which would be very expensive, or temporarily remove three sizes, to be weighed and packed later on. The entire facility must be installed inside an existing building. After weeks of Skype calls, and a technical visit by the client to the Eqraft BV factory, we agreed on the design which you see below. In the words of the client; my visit to the Netherlands was the most useful part of my investment, because I have seen solutions which I never would have imagined. 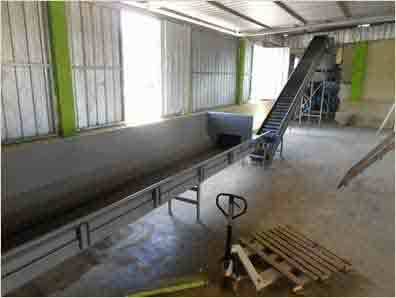 Diagram of the handling line for potatoes, carrots and onions. We won't take up time going into details here. It will all become clear when you see the photos and videos, and read about the installation of this line. 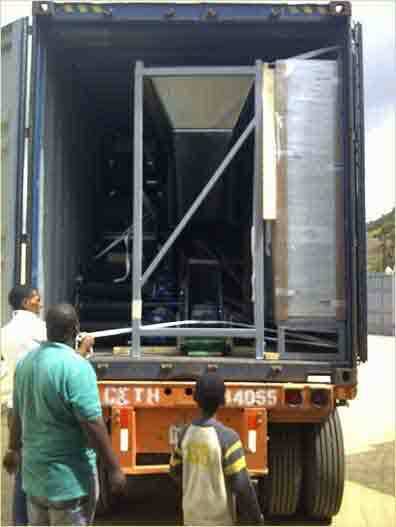 The facility came in three High Cube 40-foot containers. The technician and I arrived on the island on a Sunday night. During the Monday afternoon and Tuesday, the containers were emptied and all of the parts were neatly placed inside the building. The machines arrived with all of the equipment: cables, special tools, cable channels, and all of the nuts and bolts. Installation was successful largely thanks to the perfect collaboration between ourselves and the client. We had told them that we would need the following: Four men who were willing to work, a group of electricians to install the channels and cables to our instructions, one goods lift or forklift at all times, and another one on some occasions. A power socket for the control panel, from which the entire facility is controlled, a welder (who was barely used), and the man who was going to run the line had to be present. 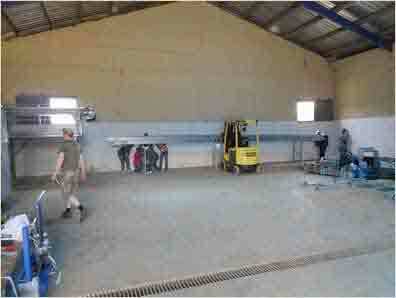 During the first few days, we installed all of the parts of the facility more or less in their final position. 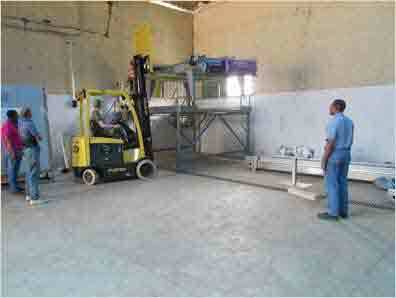 The machine in the background to the left is the first inspection table. The height of the output of this table acted as a point of reference for the height of the entire line. This is the grading machine, with rollers for four sizes. The potato and carrot washing machine is in place. 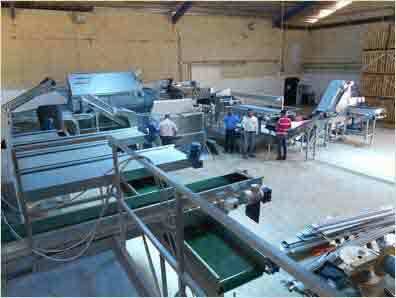 The grading machine outflows are installed, and in the background the potato dryer; carrots are not dried. 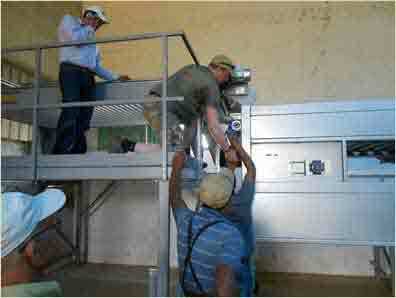 The technician puts the second inspection table in place. 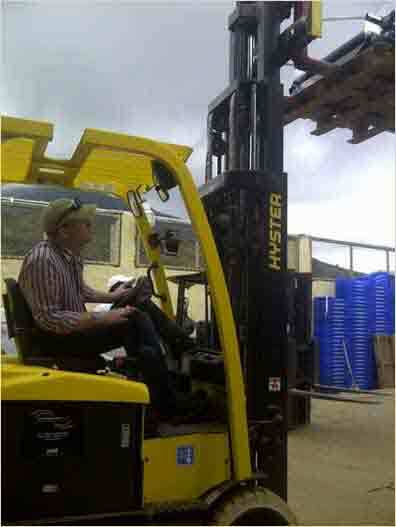 The forklift has an extension for holding bulky objects. 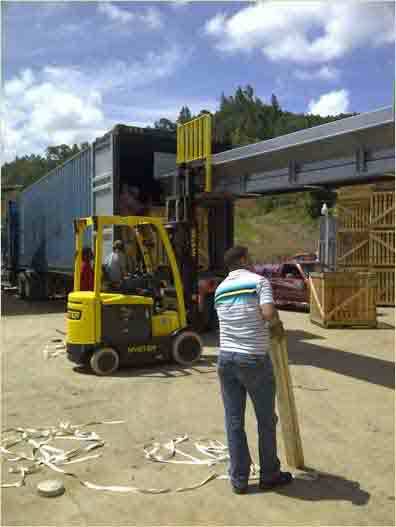 These extensions also came in one of the containers. The line continues to grow. 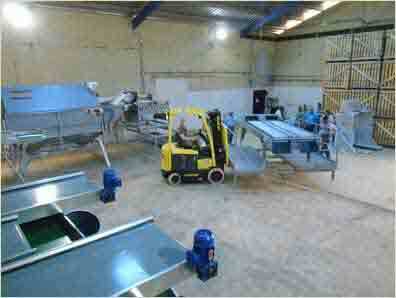 The blue machine to the right is the bag stitcher. 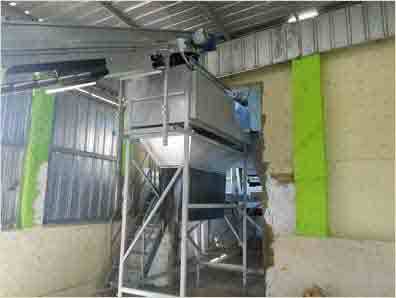 Capacity: 320 23 kg sacks per hour. 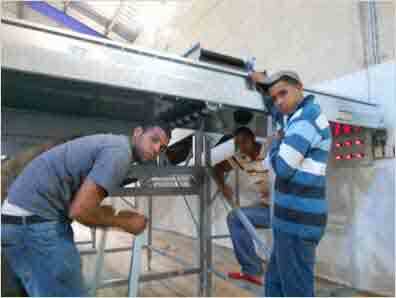 The men, keen to work and learn, are seen adjusting the supports of the machinery. 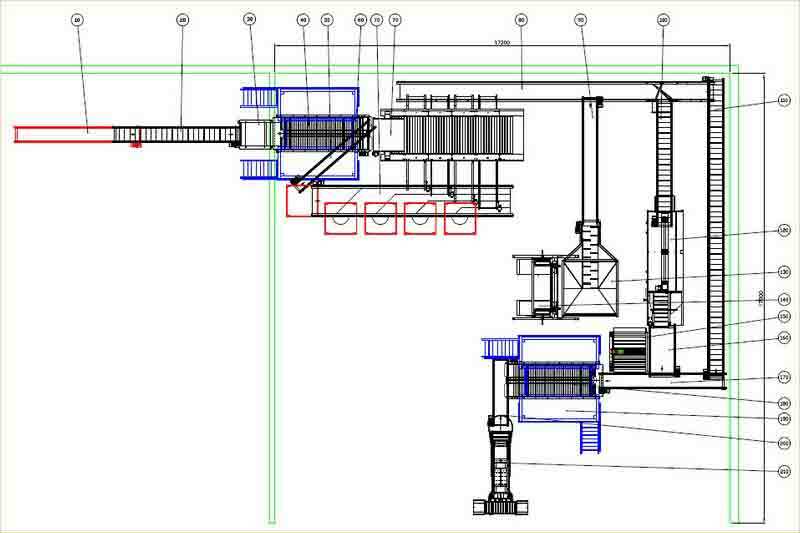 With this support system, the entire facility can be raised or lowered, which is very important for calibrating the transition between each machine. 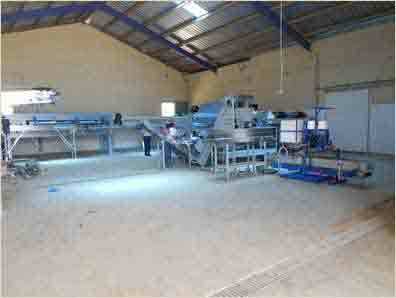 This is the receiving part of the line where the potatoes, onions or carrots are received and brushed. 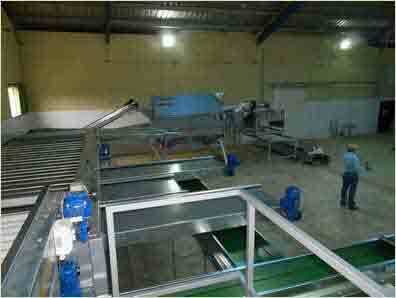 The elevator lifts the produce along a conveyor belt and into the brusher. If this belt moves in the opposite direction to the produce, it will fall into the brusher. 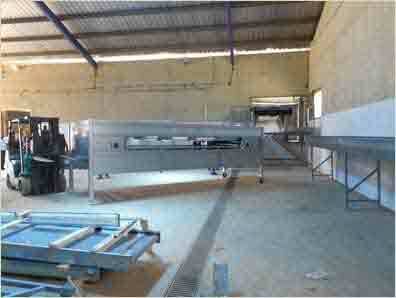 If not, the produce will bypass the brusher and go straight to the inspection table on the other side of the wall. On the fifth day the machinery was all in place and our partners were eager to test it out with the produce, without realising that we were actually working on the hardest part: wiring and checking that everything worked properly. Day five of installing the facility. The wives of our business partners spoilt us with amazing lunches. 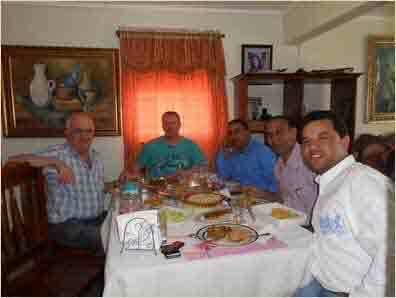 From right to left: first partner, an adviser, second partner, the Dutch technician and myself. 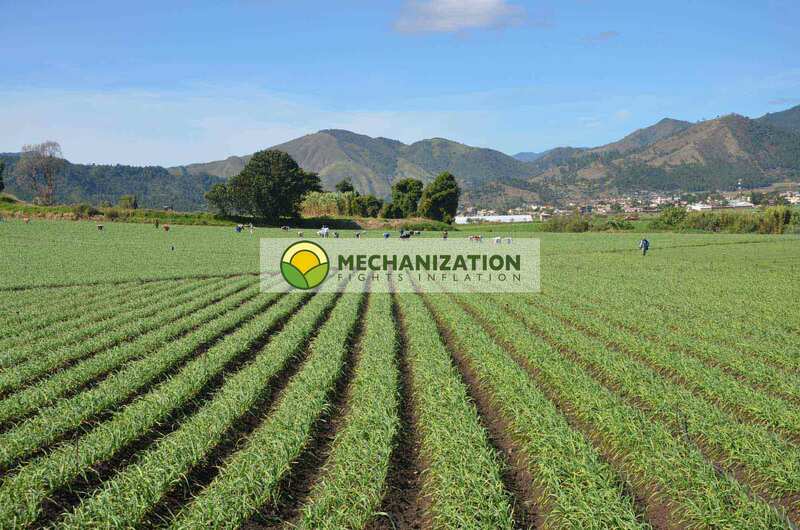 The facility, with an input capacity of up to 25 tonnes per hour, does everything necessary to receive harvested produce and prepare it for storage, or receive produce from the storage facility and prepare it for market: inspection, grading, weighing and packing.